3Dx2014 – Fred Kahl, The Great Fredini #3DThursday #3DPrinting « Adafruit Industries – Makers, hackers, artists, designers and engineers! Fred Kahl a.k.a. the Great Fredini is a sideshow performer and visionary artist inventor behind the Coney Island Scan-A-Rama 3D Portrait Studio. A graduate of New York University’s Interactive Telecommunications Program and former Executive Creative Director at New York design studio Funny Garbage, Fred is embracing 3D printing’s disruptive technology in his latest project: to create a fully 3D printed replica of Coney Island’s historic Luna Park as it appeared 100 years ago, populated by 3D scanned portraits of the island’s more colorful characters. Thompson & Dundy’s Luna Park: 3D Printed is currently on exhibit at The Coney Island Museum in Brooklyn. The things that compelled me about 3D printing in 2014 are things that moved it forward toward widespread adoption. Namely improved usability of both hardware and software, as well as compelling content beyond plastic tchotchkes. While 2014 brought many amazing new hardware advances, without a doubt the greatest advances were on the software front. We are inching forward toward the day when the software has become usable enough that we just might find a 3d printer in every home. Notable advances include the big companies (Stratasys/Makerbot and 3D Systems) bringing advanced features such as wireless connectivity allowing remote monitoring to their machines. Makerbot in particular has gone to great lengths to make their software usable to the less technical users out there and this is a trend that needs to continue. Makerbot has also revved their Makerware slicer into Makerbot Desktop, software that wants to be the iTunes of 3D printing with its built in digital store selling pre-sliced digital files. Unfortunately, the initial releases of all of these new generation machines from Makerbot and 3D Systems feels rushed to market. As new firmware and software releases come out I’m sure these printers will continue to improve and further the industry goals of bringing 3D printing to the masses. The question however is whether these companies’ approach to closed source innovation will be able to survive in the onslaught of great open source innovation that has driven so much of 3D printing’s rise in recent years? The open source community has also rallied in 2014 by making its software much more powerful and easy to use. 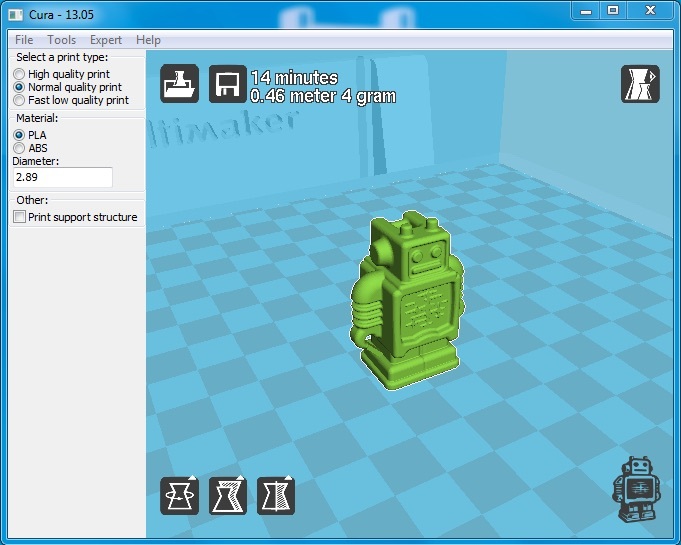 At the top of the list is Ultimaker’s Cura. Its clean and simple interface, fast background slicing reccomend it for any Reprap 3D printer user. One promising newcomer is Matter Control, which has been championed by my friends at SeeMeCNC. This powerful printer controller and slicing software is a dark horse to watch in 2015. Finally, Autodesk’s forthcoming Spark platform has a lot of muscle and hype behind it. I’m curious to see it launch and how widely adopted it will be. 2015 should be an interesting year. By far my favorite 3d printing story of the year has been the success of the Robohand Project and its numerous spin off variations that bring affordable customized prosthetics to children and the poor worldwide. To me, this is 3DP’s big success story. Combining personalization, affordability and social consciousness, the industry needs more of these stories. 3D Systems latest dog prosthetics projects for Derby the dog also created emotional resonances to this end. It’s exciting to think of a future with democratized access to prosthetics like this! 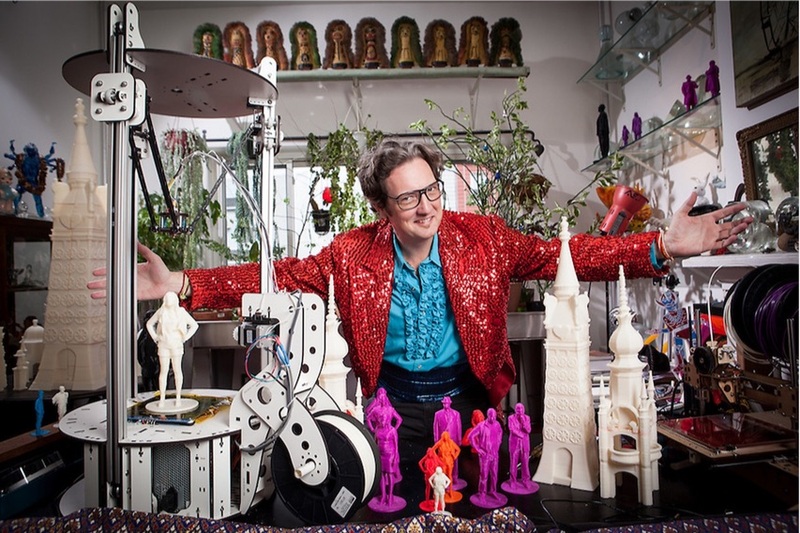 3D Printed Fashion… At Last! Finally I have seen so many 3DP fashion nightmares this year that I was truly delighted to see 3D design studio Nervous System release a truly wearable 3D printed dress. Nervous System is a great design studio in that it harnesses the power of code to create beautiful aesthetics. There’s a bunch of hype around it being “4D printed” in that it unfolds and changes with time, but whatever. The fact that it’s beautiful in its simplicity and the Museum of Modern Art added it to its collection pleases me greatly. 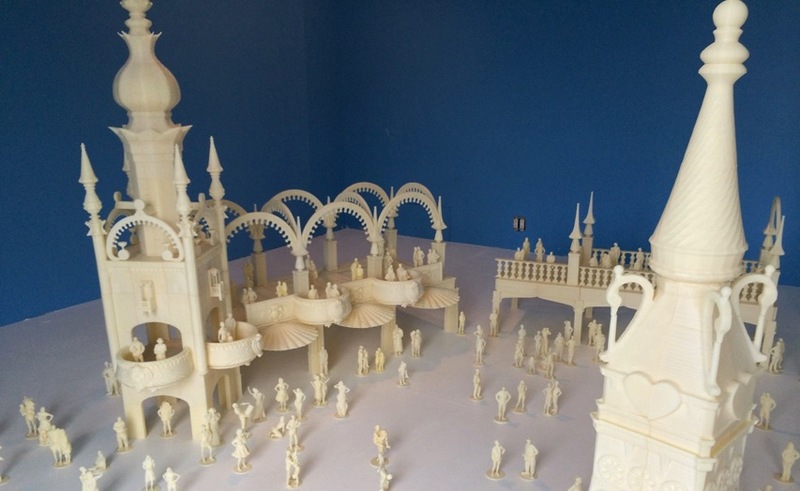 For me, 2014 was all about working on Thompson and Dundy’s Luna Park: 3D Printed, an art installation currently on view in the Coney Island Museum. I’ve also been hard at work to begin my own business based on my Scan-A-Rama 3D Portrait studio, which I intend to take on the road this year. The studio uses my low cost, open source full body 3D scanning rig, the Scan-O-Tron 3000 which I also plan to release some updates to in 2015. Finally I have been doing a lot of experiments with using 3DP PLA positives for making lost PLA glass castings and I hope to execute a large scale cast glass work based on the theme “the Gates of Hell” in 2015! I’m really excited about a lot of the metal/PLA hybrid filaments that are coming out and hope I will have the opportunity to experiment with some of these materials soon. With a general lack of industry standard filament reel size and the big printer makers moving toward proprietary cartridges I vow here and now that I will never buy a machine that requires cartridges. It’s crazy to be buying filament for $60+ a roll when it costs less than a quarter of that to make. @RichRap3D ‘s Universal Pellet Extruder is just the kind of project the community needs! I hope the community will rally behind this in 2015! Finally, I look forward to seeing what you, the 3D printing community comes up with in 2015. I hope that you create new hardware and software tools that make things easier for non technical users! I hope you make compelling designs that make more people want to own these machines! And I hope that we all can earn a living doing this. Be Excellent! Happy 2015 everyone, the future is here!